Cook fettuccine in boiling water according to package directions; drain and keep warm. Heat olive oil in a large skillet over medium heat until hot; add sausage and 1 teaspoon of oregano. Cook, stirring frequently for 3 to 4 minutes or until kielbasa is lightly browned. Remove sausage, leaving drippings in skillet. Add onions and bell peppers; cook, stirring frequently for 5 minutes or until vegetables are soft. Stir in olives, garlic, remaining oregano, paprika, salt, and ground black pepper. Cook, stirring frequently for 5 minutes. Stir in crushed and fire roasted tomatoes. Bring to a boil; reduce heat to medium-low and cook, stirring occasionally for 10 minutes. Stir in cooked kielbasa and heat through. 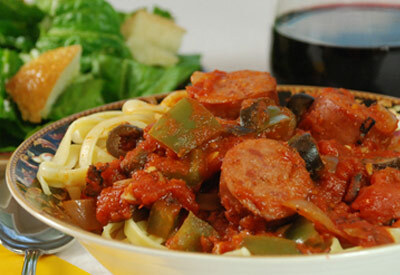 In large serving bowl or pan, toss sauce with cooked fettuccine. Let stand 5 minutes before serving.